Virtual Private Networks are necessary tools for those Internet users that favor privacy and anonymity at the time of their online sessions. They are encryption tools that take the user's IP address and traffic generated and send them to remote servers, away from hackers and other prying eyes on the web, by using computer-generated virtual tunnels. One of the dozens of brands existing in the market is Anonine, which is a little-known Swedish company that offers a solid if unspectacular service with highs and lows. While the speeds are excellent in closely-located servers, there are a few drawbacks that keep Anonine away from the elite. For example, the website, although simple and concise, does not explain enough details about the service and it doesn't make a particularly great job selling its features, either. Also, the refund policy is misleading. There is a secret three-day free trial that sweetens the deal somewhat, as does the availability for payments with cryptocurrencies and the allowance of five simultaneous connections. The prices are fair, too. Nearly all VPN providers set a monthly price in exchange for its encryption services and features, and the longer the commitment is, the lower the prorated monthly cost will be. This also applies to Anonine VPN. The service costs €6.99 for one month, €17.97 for three months (a 14$ saving,) and €47.88 for 12 months (with a 43% discount.) The three-month plan checks in at a prorated €5.99 per 30 days, while the annual mode represents the equivalent of a €3.99 monthly fee. As for payment methods, Anonine accepts all major credit cards (Visa, Master Card, American Express, Discover,) Bitcoin and other cryptocurrencies, PayPal, Global Payments, Payson, Perfect Money, and even phone and SMS payments. Anonine implements a “secret” three-day free trial, for those users that want to test the services first before committing to pay a monthly fee in exchange for the VPN services. That is not a lot of time, though, but is better than nothing! The money-back guarantee, however, is hugely disappointing and a little misleading. The company states that they offer a week-long period to get you your money back if you don't find yourself satisfied with the offerings, but there is a catch. 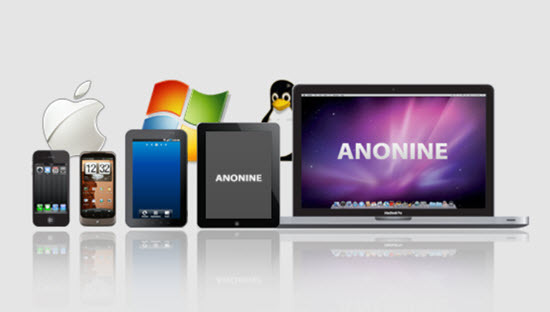 Anonine VPN supports Windows, Mac, Linux, iOS, and Android, i.e., all the major operating services and devices. The Windows client is especially easy to use, as users around the world, mostly VPN beginners, praise its straightforward nature. The company cares about their client's experience using the app and service, as they have guides and manuals to get started with the different operating systems and devices. Anonine VPN is not complicated at all, as you don't have to be an expert to download the app and use it in your device after some very straightforward configurations and settings. After you launch the app, you will be able to select a country and a server to connect after only a few clicks. There is also a Favorites list that provides the fastest servers and access to your most used locations. The client offers all the basic configurations, but nothing fancy. The website is simple, with no animations and extremely complicated elements. The information is often easy to access, but the page is buggy. As for the features, Anonine VPN offers the following protocols: OpenVPN, IPSec IKEv2, L2TP/IPSec, PPTP, and OpenVPN stealth mode (Stunnel). All plans include first-class VPN software, five simultaneous connections, and unlimited bandwidth and speed. There is also the availability of 2048bit encryption, torrents and P2P Networks, no logs, 800+ VPN servers worldwide, and a global network with 32 countries coverage. Anonine has more than 800 servers spread around the world, in a total of 32 countries. The server network can compete with some of the best VPN apps on the planet, but the number of nations available for connection is somewhat low. The servers are located in Malaysia, South Korea, Japan, India, Israel, China, Australia, Singapore, Italy, Germany, Turkey, Sweden, Russia, Portugal, Poland, Norway, Netherlands, Iceland, Ireland, France, Finland, Spain, Denmark, Czech Republic, Switzerland, Canada, Panama, Mexico, Brazil, Argentina, USA, and the United Kingdom. Anonine is speedy over short distances, but the service is below average speed with distant servers. That means that, the longer the distance separating the user from the server, the slower the speed will be. That is a recurring problem with non-elite VPNs, though. When it comes to performance, the company does not easily leak your IP address, and DNS leaks are also uncommon, which is a positive development. As for encryption strength, Anonine VPN has 2048-bit encryption, which is the best in the industry by far. Also, the company has robust security, as it provides an encrypted VPN tunnel to browse the web safely and anonymously. For example, the company doesn't explain what they do with session data, connection times, IP addresses and bandwidth utilized. The fact that the information does not appear anywhere in the site is disconcerting. Anonine does keep some information for payment operations, such as email address and the ID of your PayPal account if that is your configured payment method. While that may be a little annoying, at least they don't store phone numbers or addresses. The enterprise does use Google Analytics and cookies, but that does not have a negative effect on your privacy and ability to browse the web anonymously. Anonine is a fairly recognized VPN brand in Sweden and the Western part of Europe lacks the worldwide punch of some of the elite encryption apps and companies around the planet. As such, investments are not as substantial, and the enterprise does not provide a particularly strong customer service staff. The company has a ticket support system for users that need to communicate with the staff about a specific problem or inquiry. However, it is not very fast and responsive, taking a few points off this service.